art/sci is the alumni magazine for the College of Arts and Sciences at Case Western Reserve University. It highlights the achievements of our students, faculty, alumni and friends, and celebrates their positive impact both on the university and on the larger world. Each issue of the magazine includes alumni notes compiled from news releases, other publications and submissions from alumni themselves. If you are a graduate of the college or one of its predecessor institutions, we want to hear about the milestones in your life. Please send your updates, along with your mailing address and graduation year, to artsci@cwru.edu. 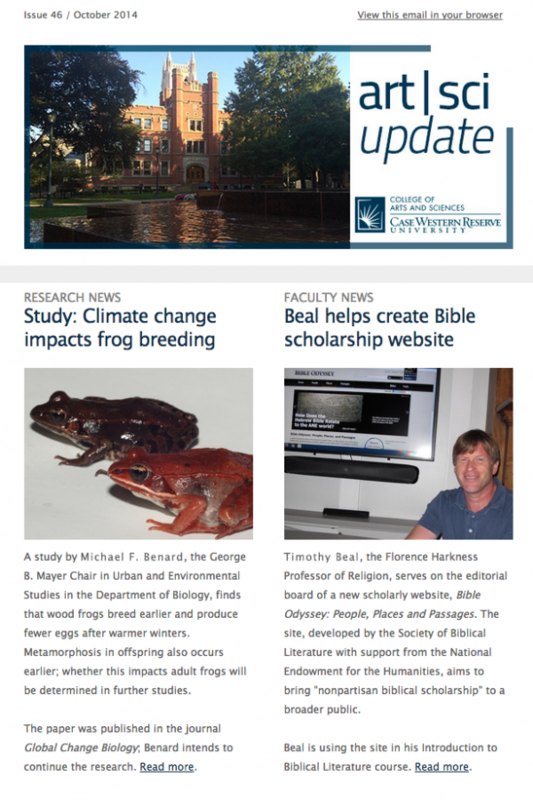 In addition to art/sci magazine, the college also publishes a monthly e-newsletter, art/sci update. To subscribe, please send an email that includes your mailing address and graduation year (if applicable) to artsci@cwru.edu.